This s a followup to RED SISTER, also starring Nona as the protagonist. Nona Grey is a Grey Sister-in-training, meaning she’s a Bene Gezzerit-esque murder nun. Wielding super-speed, uncanny magic and fearsome fighting skills, Nona is a war machine. One day she’ll be a tool for the creation and destruction of empires, but right now she’s a teenager who’s struggling to adapt to living in a society which doesn’t really want or like her, coping with a demonic bloodthirst which is trying to turn her in a monster. 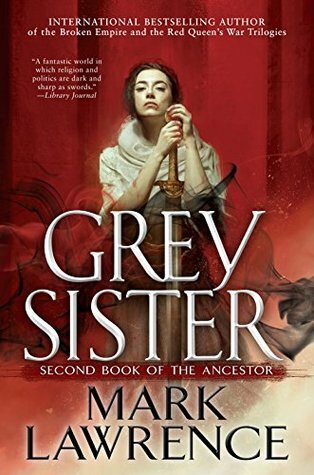 If I were to spot a difference between RED SISTER and this, I would say GREY SISTER was a more refined book than the first. By this I mean the author took the formula which made RED SISTER great and applied it again to create a very similar book. I think I liked book 1 more because it contained more inexplicable mysteries, but it was a very near thing. The pacing was very well done. Just as I was beginning to wonder if Nona would be spending all three books in battle-nun school, she was expelled and went on her own way. This story had it’s fast moments and it’s slow moments, but overall I feel that they played well together. The setting, an ice-age locked planet which is barely kept thawed by a magic solar mirror in the sky, is still really cool. The characters were about as good here as they were in the first book. Nona developed a satisfactory character arc here, but I would have liked if the other main characters had as good of an arc as well. The narrative style was interesting, with ‘flashbacks’ to the future, where we see events in a future book in the series. I liked it, but this book didn’t use them as well as the first book in the series. Time for some constructive criticism. The plot of this book, once again, was all about ‘nobles trying to put peasants in their place.’ Just like last time, I find this plot to not be compelling. Indeed this time I find it even less compelling because this is the second time in a row the author used it. A whole lot of the antagonists are ‘evil for the sake of evil,’ (or rather ‘jerks to peasants for the sake of being a jerk’) which makes them not very compelling antagonists. While the antagonists don’t have quite as bad a case of the Idiot Ball as they had in the first book in the series, it’s still pretty bad. Nona always wins, and because she always wins it devaules her victories. Since she never fails at anything I as a reader am never afraid that she’ll lose. It makes me feel a lot less worried, and thus reduces tension. (“Oh no, a cult of super-witch-assassins is coming to kill Nona. Whatever will she do? Oh, right. Kill them all. Nevermind.”) Nona is so impervious to losing that the author hangs a lantern on this fact in the middle of the book. Net total, I don’t think this is quite as good as RED SISTER, because where RED blazed a new trail this merely followed in it’s footsteps. (Ah, the dreaded middle book. Not as new and shiny as the first book, or as dramatic and memorable as the third.) This story has fun moments, but in the end I don’t think it quite adds up to matching it’s predecessor. I Highly Recommend you read RED SISTER. If you like RED SISTER you’ll probably like this too. I’ll be reading HOLY SISTER, whenever it debuts.